There is something both terrifying and enervating about coming upon any massive display of ants! Just as the sun was setting, we began the long hike out of the Calakmul Maya Ruins. Our pathway was suddenly inundated in Leaf Cutter Ants, all hurrying along their broad trails which often crossed the foot path. They had begun their nightly forage for leaves and flowers to sustain their underground fungus gardens. We traced the trails back until we found the nest opening. There were in fact, many entrances within the 20 meter clearing (see last picture) with massive numbers of ants heading out in different directions. These large clearings, completely denuded of all vegetation, are typical of an area directly over a major nest. The pictures show the three main types of individuals: large soldiers with enormous heads, medium sized "Media workers", which are those responsible for cutting and transporting foliage and the tiny "minima workers" which cut up the foliage returned to the nest and feed the fungus gardens. These tiny ones also go out on foraging raids and help protect the media workers from parasitoids. They often ride on pieces of foliage being carried by soldiers or media workers (see Picture 4). Their saliva keeps bacteria from growing on the fungus and they may start adding their saliva to the foliage as it is being returned to the nest. Forest around Calakmul Maya Ruins, Reserva de la Biosfera Calakmul. If anyone might think that ants don't really care about each other, see picture 5. 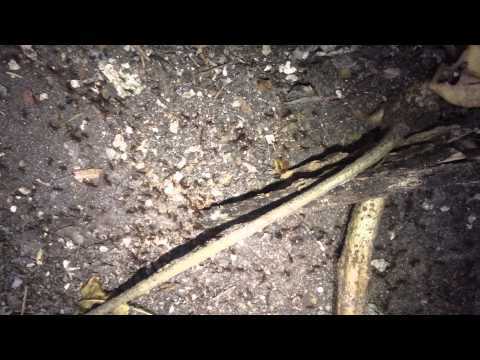 We witnessed a group of ants (all sizes) form a circle around an ant that had been accidentally stepped on. The ants stayed in a circle facing the injured ant for a surprisingly long time. It was really very touching. Note the strong body spines and the tiny teeth on the inner edges of the mandibles (picture 3). Unbelievably, the huge winged females of this species are collected during nuptial flights, fried and eaten. We came across some field workers collecting these ants in buckets once during a nuptial flight at 5 in the morning. They plucked the wings off the females and put them in buckets of water. They told us no one will eat the males because they taste like urine.